…..and we would so appreciate your support ! If you received holiday gifts, backpacks, movie tickets or attended our training in March, would you mind help us? We were able to offer all of these things at no cost to foster families because of generous donors like you during the year. The Kitsap Great Give is on Tuesday and we’d appreciate your support and help in spreading the word so that we can continue to support you in so many ways! Please visit this link to donate by Tuesday April 23rd! With sincere appreciation for all you do every day! Register now for Foster Parent Appreciation Dinner! Free day at Camp Seymour! Let’s go to camp! Haselwood is partnering with Camp Seymour to invite our amazing Foster Family’s to check out Camp Seymour with transportation provided. On Sunday, April 7th, we will visit Camp Seymour for an afternoon of activities and fun for the whole family. The bus will leave Haselwood at 1pm, arriving to activities from 2-4:30pm followed by a family meal at 4:30pm, and bus returning to Haselwood after the meal. Seymour Sundays are a free event, designed to give you and your camper a taste of what it’s like, with the opportunity to meet our camp directors, ask questions, and see our beautiful property. Enjoy camp activities, tour camp, experience a camp meal and speak with the camp director and staff. Register Now for our Foster Parent Conference! LIMITED CHILD CARE IS ONLY AVAILABLE BY EMAILING JEANIE! Email Jeanie-Johns with your name, kids name and age. We have break out sessions with Treehouse, Coordinated Care, a panel of state DCYF workers and Kitsap Strong! Inspiring keynote session with MaryAllison Brown of Reflecting Relationships. We will also have some great raffle prizes, including a 2 night stay at the Great Wolf Lodge for the FPAWS conference in May! 2018 HOLIDAY GIFT REGISTRATION INFO! This form will accept information for up to 4 children. Please fill out a separate form if you have more than 4 children in your home. We will provide gifts for all the children in your foster home, regardless of legal status. Please feel free to email us at president or call Naomi at 206-228-3885 if you have any questions! Thanks! We are sad to announce that we have suspended dinner meetings for this year. Our volunteers are dwindling and we need to use them for our big events. Stay tuned for details for a half day training in Spring 2019 that will help you reach your requirement!Thanks for understanding! Registration is now open for our annual Back To School event! KFCA will provide backpacks full of school supplies to all Kitsap foster kids (adoptive, kinship, foster) OR Kitsap foster kids placed in other counties. The deadline to register is AUGUST 1st . If you receive a new placement after this date, please email president to register. If you are a social worker registering your kids, PLEASE make sure that the foster parents are aware that you are doing so. If you can’t come at this time, please make other arrangements because we cannot guarantee supplies after this date. Our board works very hard to make this event happen and we hope that you appreciate our work. However, we do have to adhere to deadlines in order to fulfill other commitments. Hi all,Registration is now open for our annual Back To School event! KFCA will provide backpacks full of school supplies to all Kitsap foster kids (adoptive, kinship, foster) OR Kitsap foster kids placed in other counties. Having trouble viewing or submitting this form? Note that this is a shopping experience on Sun Dec 3rd from 2:30pm – 4:30pm at New Beginnings Church in Bremerton. This form will accept information for up to 4 children. Please fill out a separate form if you have more than 4 children in your home. We will provide gifts for all the children in your foster home, regardless of legal status. 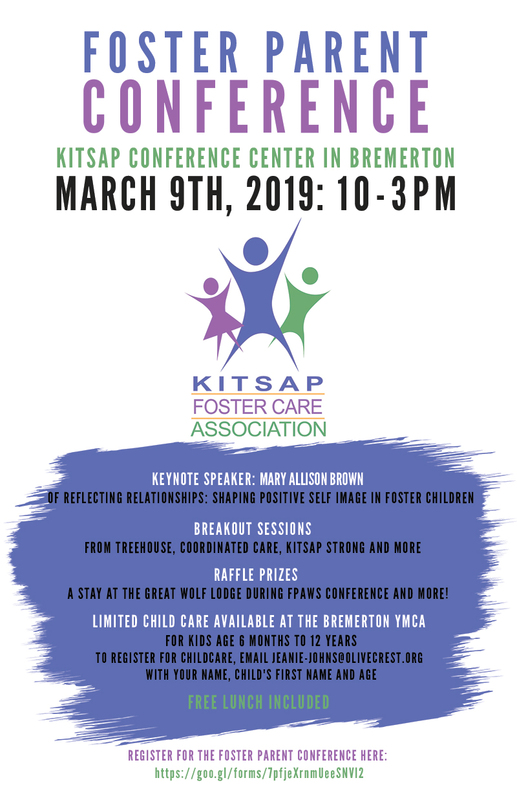 Please feel free to email us at president@kitsapfostercare.org if you have any questions! Any other information we need to know? Please keep in mind that this will be a shopping experience and not personalized gift pick up as in the past. Thank you! One Call for All has started! Thank you for supporting Kitsap foster kids!